About 8 or 9 months ago, I bought a Ninja blender. I don’t know about some of you, but for me, it was what I would consider a pretty big financial splurge. I can’t just go around buying up a $170+ ANYTHING, no matter how much I love my kitchen gadgets. However, there was a major discount in the department store on their kitchen appliances so I was tempted. And once I get tempted, things just typically seem to take off from there. I reasoned to myself that it wasn’t going to be likely that this blender would ever come at this price again, or at least in the near or distant future. I reasoned that if I did actually ‘treat myself’ and buy it then I’d really and finally get into the whole ‘smoothie/shake’ thing and start taking them with me to work to give myself a nice little health boost. I reasoned that the advertisement said that the blender could actually double as a pretty good food processor as well. Long story short, I bought it. And to make the story even shorter I’ll just come right out and admit: the smoothie health kick thing really didn’t work out. I just…I don’t like them. I’m not a fan of drinking much of anything besides water and coffee to be honest and the idea of drinking ‘meals’ just turns off my appetite almost completely. I probably made like, four smoothies before I called it quits and used all the fruit I had bought up for that purpose to just bake a pie. But I still had the blender. Well, I wasn’t about to let my Ninja go to waste. I’ve been using it. Just not as a blender. Mainly it just helps me put together my pie crusts more easily and less messily than I did before by hand. Oh yeah, and they’re not lying about the quality of that blade, guys. It’s very sharp. Supercalifragilisticexpialidocious sharp. As my knicked, cut and sliced open fingers can fully attest to. Recently, I’ve found a new efficient use for my Ninja blender that gives me new hope that just maybe I wasn’t a sucker that day in the department store when I splurged and bought it. That new hope is Hummus. One thing you should all should know about me and hummus: I’m kinda obsessed with it. It’s the universal condiment; I can eat it on anything. And I do mean ANYTHING. I’m pretty good at practicing portion control with food in general, but let me tell you something: I have little to no portion control when it comes to hummus. Nothing but the realization that if I don’t stop eating it, I will run out and have to buy more will actually make me stop and put it away. Good thing it’s pretty healthy all things considered, huh? Grocery store hummus is ridiculously overpriced, so every time I go to a Middle Easter or Lebanese restaurant, I will try their hummus, just to see what their ‘packing’ so to speak. If the joint has more than one flavor of hummus, that’s a pretty good sign so far as I’m concerned. It means that the owners really have their priorities in order. They know what life’s all about. The best hummus I’ve ever had comes from a Middle Eastern deli in my town called Woody’s Oasis, coming in Regular, Spicy and Garlic flavors. I could eat it every single day for the rest of my life and never, ever get tired of it. My wallet may be lighter though. This is where my Ninja came in. I decided to put that baby to good use and try making hummus of my own at home with one of my favorite ingredients: roasted red pepper. Now for those that don’t have a Ninja, don’t worry about it: I really don’t think that your hummus will suffer because of the secret weapon in my back pocket that is the KEY to super smooth, creamy hummus every time. Want to know what it is? Water + Baking Soda. Boiling your chickpeas/garbanzo beans in a combination of the two will peel them for you, eliminating those pesky outer skins that oftentimes result in thick, pasty hummus that no one wants. So whatever you do, do not-DO NOT- skip the step of simmering the chickpeas in the water/baking soda. You’ll live to regret it, I promise you. Now look: my hummus may not be the hummus from Woody’s Oasis, but I gotta tell you all that I was pretty impressed with myself when I took that first bite. Because it’s still pretty friggin delicious. So much so that I turned right around and made a second batch almost immediately. Remember? I have no sense of control when it comes to this stuff. But it’s chickpeas, so that makes it okay. 1. Pour chickpeas into a pot and submerge with water. 2. Add baking soda and bring to a rolling simmer, over medium high heat. The skins should begin to rise to the top. 3. Using a slotted spoon or spider skimmer, remove the skins from the pot and discard. When the chickpeas are just tender (but not mushy) drain them in a colander, then immediately submerge them in cold water. Use your hands and lightly rub them together; the remaining skins should slide off and either float to the bottom or rise to the top. Discard skins. 4. Place the peeled chickpeas, as well as all the other remaining ingredients into a food processor or blender and process on high until smooth and creamy. Drizzle with olive oil and smoked paprika and serve. We hare big fans of hummus and we will try this tomorrow that is for sure 🙂 Thanks for sharing!!!! I’ve heard great things about the Vitamix, but I get FANTASTIC results with the Ninja Suzanne. So if you’re looking for a cheaper option, I can strongly recommend it, especially if you’re into smoothies shakes and the like. Thank you! Looks gorgeous. I’m all for finding new uses for toys I already own. Especially expensive ones! Here’s a really good, super easy use for it- thank you! I love hummus! Especially using dried chickpeas instead of canned. I will definitely try this. My favorite restaurant has an appetizer platter with three different hummus flavors, I can’t get enough of it! I am with you, smoothies aren’t my thing. We blend veggies when I love them whole?! I like to eat them, not drink them! Haha! No problem! It’s amazing and surprisingly versatile 🙂 I have some recipes on my blog for it, if you get one. I haven’t used red peppers in hummus before. Love that orangey-hue colour. Will give it a try. Thanks for sharing! Thank you- it’s a wonderful combination. Red peppers have always been my favorite! Love you homous 🙂 I was given one of those fab blenders designed for making smoothies and juices and I don’t ever have either so I did question the gift…! However, it makes the best homous EVER! What a creative recipe Jess! Matt absolutely LOVES hummus and he makes it all the time in our food processor. I am 100% with you on the smoothie thing… I just never really got on board with that health trend. So glad you found other uses for your awesome ninja blender! I’ve really wanted to try black beans or lima beans to make hummus with, as I love them both and think they would create a nice texture. Thanks Polianthus! Oh, we eat lots of hummus here! Store bought brands (yes, we do pick those up in a pinch) and homemade with tahini and fresh lemon juice. Yours looks amazing!! One of these days, I’m going to splurge on a fancy blender. I think the store bought brands taste great (when they don’t have listeria in them lol) but I just can’t afford what they charge for them . 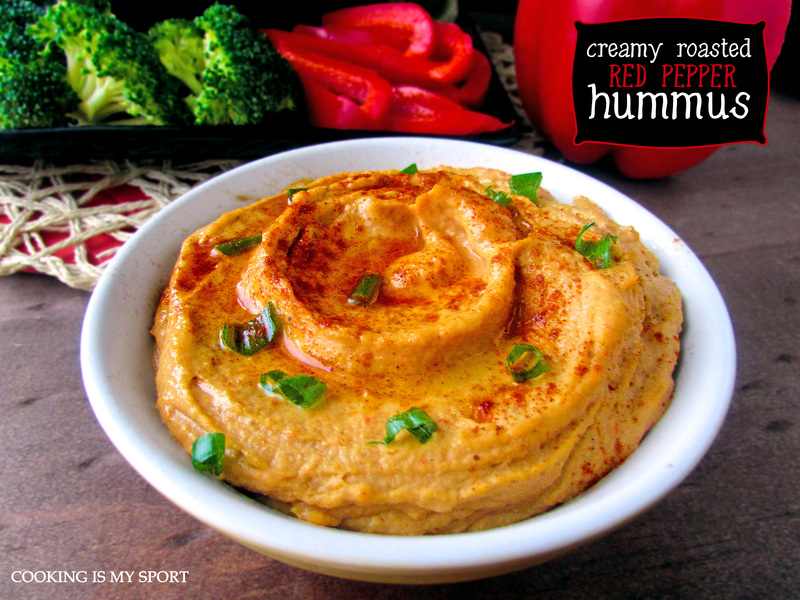 I love hummus, too–this looks so good! I want to get a better blender sometime, so I’ll have to keep the Ninja in mind! 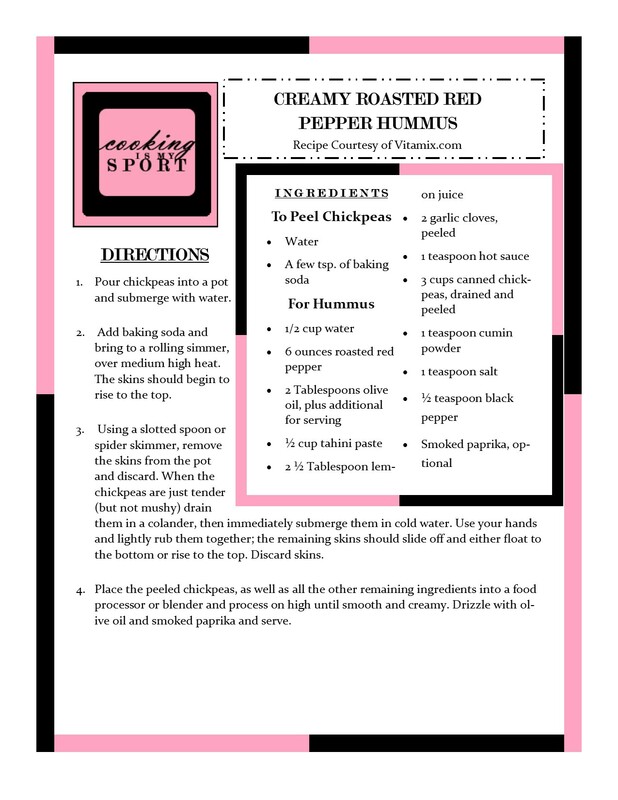 Love your title, cooking as sport is awesome! And your hummus looks great too! This looks delicious! 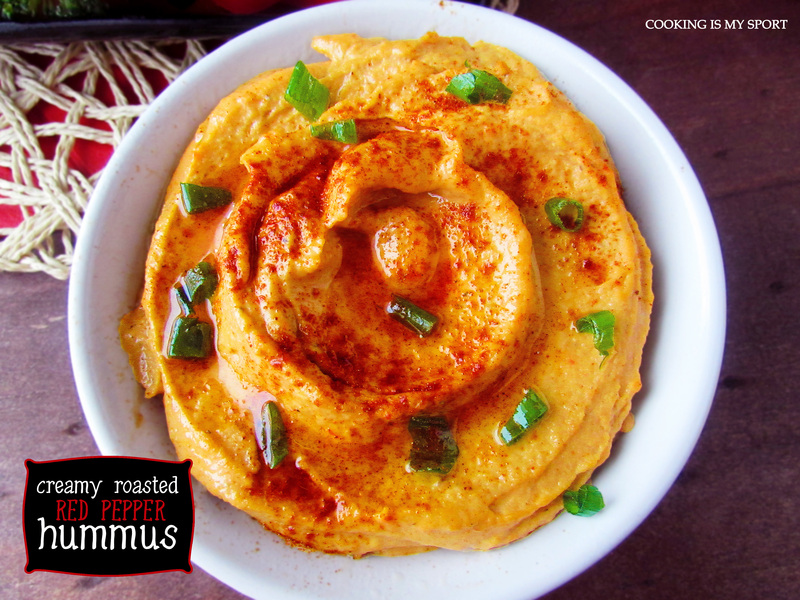 I love making hummus and this looks like a great variation! 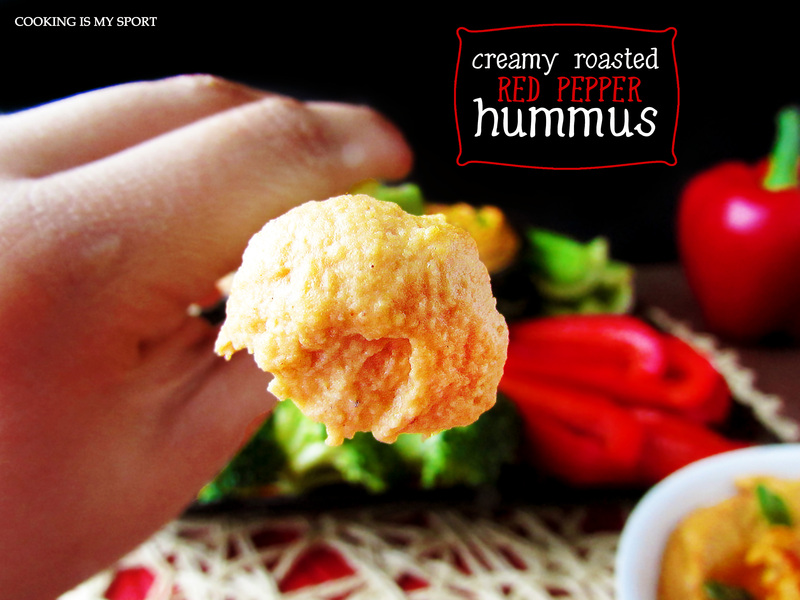 Wow – this hummus with a chip or tortilla would be amazing! Looks fantastic! I can’t wait to try it. 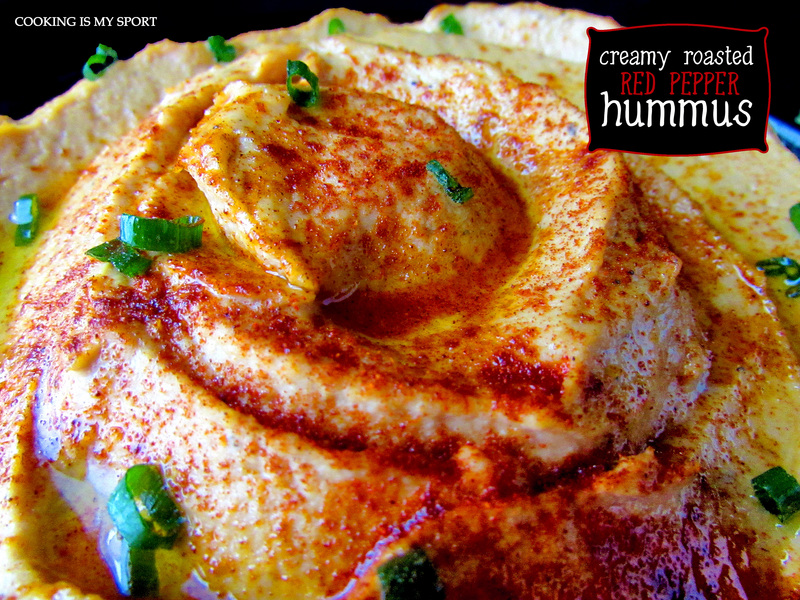 This hummus looks delish! You have a beautiful blog by the way, lovely layout and theme! 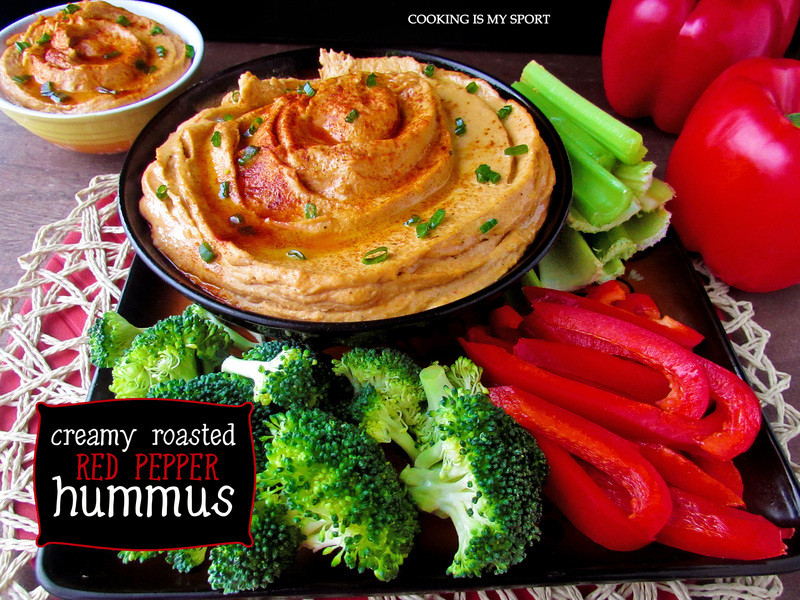 I have a Ninja too, so excited to put it to use for this yummy hummus, and great post!